How do you know your flag should be retired? Sometimes your flag will only need to be cleaned to restore its original appearance. Regular cleaning of your flag can extend its life considerably. Flags can be machine-washed with a mild detergent in cold water. Flags should be hung to dry or laid flat. Do not fold the flag if it is damp. If it is possible, mend a tattered flag at early signs of wear. The edge furthest from the staff, known as the "fly" end is usually the first part of the flag to show wear. The fly end may start to unravel due to weather conditions. It is really up to you to decide when your flag is ready to be retired. If the flag is unable to be repaired or is too tattered then the flag should be retired. There are many local organizations that will take your flag for proper retirement. 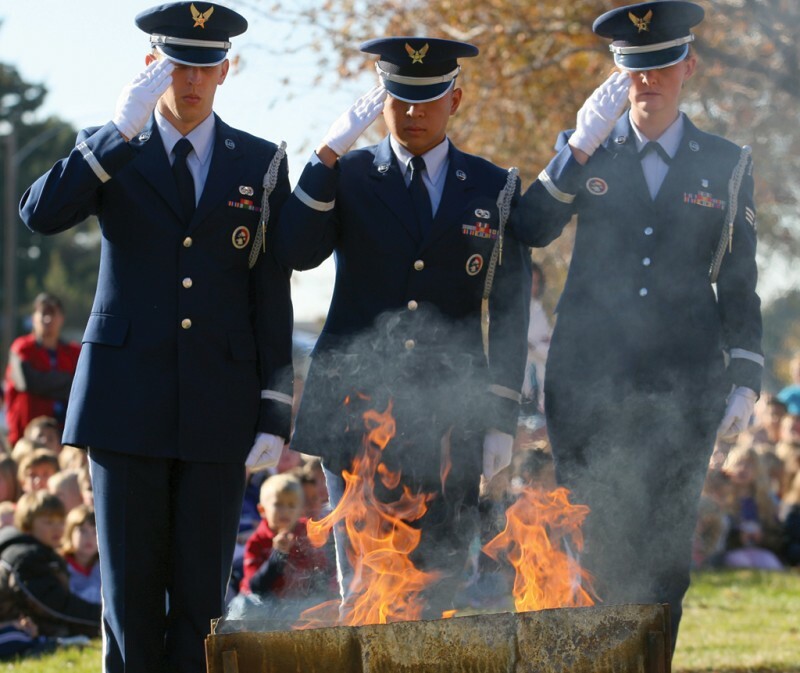 The preferred and most dignified way to destroy old, worn, frayed and/or faded U.S. Flags is by burning them. Isn’t burning the flag an act of desecration and a sign of rebellion? No, throughout history, burning or cremation has long been considered a dignified way of paying respect to the deceased and to objects worthy of veneration. Burning has been applied to flag retirement to offer the most reverent method of final tribute. Who is authorized to retire a U.S. Flag? Anyone. The Flag code does not authorize any particular organization with the duty of retiring unfit flags. Any one person or group can do it. However, flags should be retired in private at a non-public location and the ceremony should be a solemn, dignified event. There is no one official ceremony required or recommended. 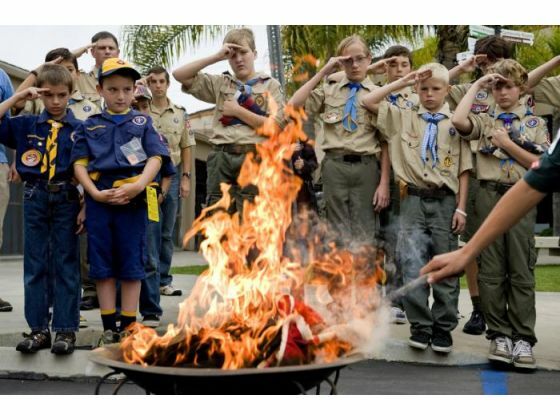 What are your options if your municipality prohibits open fires and/or the burning of flags? If you live in such a community, you will need to find an organization that provides flag retirement services. Contact your local chapter, post or unit of such a community organization. An alternate option is to separate the blue star field from the stripes and then to separate the stripes from each other. Once this is done the material is no longer a flag and the pieces may be respectfully interred as part of the ceremony. Is it permissible to cut up the American flag? Yes, some organizations even recommend cutting the flags into smaller pieces before placing them in the incinerator or on the fire. When doing this please keep the union of blue intact. Doing so symbolizes that the unity of our union should never be broken. When burning flags made of synthetic fibers, be aware that they may burn quickly and emit noxious gases into the air. Handle such flags with care. It is important the fire be sizable-preferably having burnt down to a bed of red hot coals to avoid bits of the flag being carried off by a roaring fire-yet be of sufficient intensity to ensure complete burning of the flag. Make sure the fire is safely extinguished before leaving the location.